Since last May I have been moving swiftly to set the Church of God back on the track as GOD'S CHURCH. I have set the radio and television programs back on GOD'S track. Secularism and the leaven of modern intellectualism and Ph.D.ism had turned Ambassador College into just another of this world's colleges. To set it back on the track I have had to start all over again, as in 1947, with one single undergraduate freshman class. I have put back in charge those who were taught God's REVEALED KNOWLEDGE under me in the earlier years. I hope that and my personal very frequent taking of the forums will, within the year, set Ambassador College back on the track as GOD'S COLLEGE. In all this, I deeply appreciate and am grateful from the heart for the loyalty and the standing solidly behind me of all you in the ministry in this difficult task. At this point I consider it necessary to succinctly review the PURPOSE, policy and state of The Plain Truth and its future. God forcibly called me to His service in 1926, later to commit to me Christ's GREAT COMMISSION — to announce overall to the world the soon-coming KINGDOM OF GOD — an entirely NEW civilization of GOD'S making. In 1927 God inspired me with the vision of publishing GOD'S magazine. Jesus had divine TRUTH by saying, "Thy word [the Holy Bible] is TRUTH." God had been opening my mind to understanding of His truth. I had been experienced in magazine and newspaper writing. God put it in my mind to publish HIS magazine, making His TRUTH — the Bible — PLAIN, CLEAR UNDERSTANDABLE, INTEREST-GRIPPING, DYNAMIC. In 1927 I had a commercial artist design a front cover for this magazine, to be called The Plain Truth. It was seven years before God opened the way to actually start producing it — and even then as a virtual no-cost mimeographed "magazine." Jesus Christ, living HEAD of God's Church, used me in raising up the present era of that Church — the parent Church starting with 19 members in August, 1933. The Work of God — the GREAT COMMISSION — started as an infinitesimal operation — a virtual mustard-seed beginning — as God starts activities through human instruments. But, also, like the proverbial mustard seed, it GREW — at the unmatched rate of 30 percent a year over a 35-year span. What Christ called me to — what He started and has built through me — is the WORK OF GOD, not of MAN. It is not of this world. God called me out of this world, and He has called others out of this world and its ways to assist me in HIS Work. But as God has prospered His Work and it has grown to worldwide operations — and in going TO this world, a multi-million dollar organization — those who have been brought into the Work are prone to assume it to be just another of this WORLD'S organizations — where the actuating attitude and motive is the GET way instead of God's GIVE way — and where it is operated with the approach of this world's carnal and intellectual secular concepts. I am deeply sad to say, the same spirit of carnal secular intellectualism that infiltrated God's college has also infiltrated HIS MAGAZINE — Christ's MESSAGE IN PRINT to a deceived world! I see now articles on child rearing whose approach is the carnal psychology of Satan's higher education and slanted contrary to God's PLAIN teaching in His truth — the Bible! I see articles, and also booklets now being produced, with a bibliography of source materials of up to 16 secular "authorities." Let me state my personal evaluation of the situation. I believe the managing editor to be sincere, loyal, desiring to do the right thing — which is GOD'S and not his own thing. I believe he simply needs more cooperation and guidelines from me. Therefore, I am here outlining some basics, policies, guidelines and directives. What I had in mind was articles dealing with world conditions and human interest problems — but always in the main content of the article, approaching that problem and dealing with it from the BIBLICAL revelation — so that in fact it was actually making plain the TRUTH — derived from revelation, not from science or secular scholarship of behavioral science and university-brand psychology. Today we live in the day of man (enslaved invisibly by Satan) — and a civilization that in fact is the world of human nature — Satan's world! The PLAIN TRUTH was envisioned and brought into a publication that proclaims the WORLD TOMORROW — an entirely different civilization — GOD'S CIVILIZATION. Now this is of SUPREME IMPORTANCE — because The Plain Truth was founded under God's leading to be one of the two — and perhaps even the No. 1 medium for carrying out the GREAT COMMISSION. Some might think radio and television to be our No. 1 means of proclaiming Christ's GOOD NEWS but, without THE WORD OF GOD IN PRINT, radio alone could never have built the Work — and actual records show that daily half-hour radio broadcasting has far out-weighed television — though the latter, if properly used, may be very effective. You know, I really died, just over a year ago — though by mouth-to-mouth resuscitation they brought me back in 30 or 45 seconds — or perhaps 1 1/2 minutes. God brought me back from death because HIS CHURCH, HIS WORK, HIS COLLEGE AND HIS 'PLAIN TRUTH' had gone secular– and God had been virtually booted out the window. And now I must move as swiftly and decisively to get The Plain Truth back on the track as GOD'S MAGAZINE! Utterly UNIQUE! Totally unlike this carnal world's magazines. Now, back to the BASIC POLICY and PURPOSE of The Plain Truth. I have already stated it — to make plain God's revealed TRUTH as it is in the Bible. To make the Bible interesting! To make it understandable! To make it COME ALIVE as a NOW Book! What built the Church and the Work? The central hub of the Work was daily half-hour radio broadcasting working with The Plain Truth. 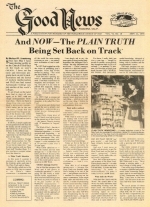 The broadcasting and later telecasting and even advertising space in mass-circulation magazines and newspapers added subscribers to The Plain Truth. The Plain Truth was then used to open minds to revealed knowledge, informed of the KINGDOM OF GOD and by offering, with it, booklets and the correspondence course. This basic program was supplemented by monthly co-worker letters from me, semi-annual letters to PT subscribers and a LETTER ANSWERING DEPARTMENT (LAD, later PCD) along with a growing and dedicated ministry. The whole concept of every branch of this Work was to GIVE God's truth to the world and to SERVE (GIVE TO) the brethren. God continually added to His Church. This plain, simple, direct program worked! I remember how Bill Tilden used to say, "Never change a winning game — always change a losing game." I am taking steps immediately to restore a qualified and experienced Letter Answering Department, such as we used under Dr. [Clint] Zimmerman and Wilbur Berg. I may have to find time (how, I do not know) to do new daily half-hour radio broadcasting. We reach people 10 times more effectively through the eye than through the ear. True, TV offers both, but TV in the past has not been comparatively productive — partly due to the secular, documentary-type programming. To use TV daily with blanket national coverage is immediately impossible. We may use the most modern professional systems and innovated techniques, with the original MAKE-THE-BIBLE-PLAIN concept in reading content. The Plain Truth can and must be made the No. 1 MAGAZINE ON EARTH — utterly unique — no subscription price nor advertising revenue — making the biblical message not only plain but dynamically interest-gripping, with a stronger public-reader appeal than even Reader's Digest. It must become the No. 1 QUALITY magazine, as a vigorous, dynamic, interest-grabbing magazine that literally makes God's truth COME ALIVE! When my mind was first opened to God's TRUTH, I found it the most interesting, absorbing thing that had ever entered my life. I could hardly tear myself away from the Bible. The things that fill most minds in this world became ridiculously unimportant and boring. That interest has never waned. We must allow that same intense interest in the mind and heart of the MILLIONS! We must at once set it back on the track as GOD'S magazine, sparkling with His living TRUTH. We must find, somewhere in the Church of God, the writers who themselves FEEL and EXPERIENCE the fascinating, glorious LOVE of GOD'S TRUTH and who can make articles come alive with vigorous Holy Spirit INSPIRATION! We are the only voice in the wilderness of today's evils, frustrations, discouragements, with the world's ONLY HOPE — and it's one SURE HOPE of happiness, abundance and eternal life! We are going to develop the NEWSSTAND circulation into multiplied millions. But first, before I sell The Plain Truth to the news-stand audience, I must have a PRODUCT that will grab attention, arouse instant interest, create suspense and the DESIRE FOR MORE — AND MORE — AND MORE OF THE SAME! The GREAT COMMISSION is our uniqueness, our WONDERFUL CALLING, that must pervade clearly every issue of The Plain Truth. But of course, first, it must pervade our own lives, until we become HUMAN DYNAMOS for GOD'S TRUTH! WHAT A GLORIOUS PRIVILEGE — we can be the inspired instruments of the LIVING GOD giving His wonderful TRUTH to a dying world in its LAST DAYS!